A few days ago, I wrote about how to set up and configure extlinux (syslinux) as a bootloader. But on Debian or Ubuntu, if you make changes to files like /boot/extlinux/extlinux.conf directly, they'll be overwritten. So what's a Debian user to do if she wants to customize the menus, add a splash image or boot other operating systems? First, if you decide you really don't want Debian overwriting your configuration files, you can change disable updates by editing /etc/default/extlinux. Just be aware you won't get your boot menu updated when you install new kernels -- you'll have to remember to update them by hand. It might be worth it: the automatic update is nearly as annoying as the grub2 updater: it creates two automatic entries for every kernel you have installed. So if you have several distros installed, each with a kernel or two in your shared /boot, you'll get an entry to boot Debian Squeeze with the Ubuntu Oneiric kernel, one for Squeeze with the Natty kernel, one for Squeeze with the Fedora 16 kernel ... as well as entries for every kernel you have that's actually owned by Debian. And then for each of these, you'll also get a second entry, to boot in recovery mode. If you have several distros installed, it makes for a very long and confusing boot menu! It's a shame that the auto-updater doesn't restrict itself to kernels managed by the packaging system, which would be easy enough to do. (Wonder if they would accept a patch?) You might be able to fudge something that works right by setting up symlinks so that the only readable kernels actually live on the root partition, so Debian can't read the kernels from the other distros. Sounds a bit complicated and I haven't tried it. For now, I've turned off automatic updating on my system. But if your setup is simpler -- perhaps just one Debian or one Ubuntu partition plus some non-Linux entries such as BSD or Windows -- here's how to set up Debian-style automatic updating and still keep all your non-Linux boot entries and your nice menu customizations. First, take a quick look at /etc/default/extlinux and customize anything there you might need, like the names of the kernels, kernel boot parameters or timeout. See man extlinux-update for details. For configuring menu colors, image backgrounds and such, you'll need to make a theme. You can see a sample theme by installing the package syslinux-themes-debian -- but watch out. If you haven't configured apt not to pull in suggested packages, that may bring back grub or grub-legacy, which you probably don't want. menu title Welcome to my Linux machine! Of course, you could have a debian.cfg, an ubuntu.cfg, a fedora.cfg etc. if you wanted to have multiple distros all keeping their kernels up-to-date. Or you can keep the whole thing in one file, theme.cfg. You can make a theme as complex or as simple as you like. When my new netbook arrived, I chose Debian Squeeze as the first Linux distro to install, because I was under the impression it still used grub1, and I wanted to avoid grub2. I was wrong -- Squeeze uses grub2. Uninstalling grub2, installing grub-legacy and running grub-install and update-grub didn't help; it turns out even in Debian's grub-legacy package, those programs come from grub2's grub-common package. What a hassle! But maybe it was a blessing in disguise -- I'd been looking for an excuse to explore extlinux as a bootloader as a way out of the grub mess. Extlinux is one of the many spinoffs of syslinux -- the bootloader used for live CDs and many other applications. It's not as commonly used as a bootloader for desktops and laptops, but it's perfectly capable of that. It's simple, well tested and has been around for years. And it supports the few things I want out of a bootloader: it has a simple configuration file that lives on the /boot partition; it can chain-load Windows, on machines with a Windows partition; it even offers pretty graphical menus with image backgrounds. Since there isn't much written about how to use extlinux, I wrote up my experiences along with some tips for configuring it. It came out too long for a blog article, so instead I've made it its own page: How to install extlinux (syslinux) as a bootloader. Intel hosted a MeeGo developer camp on Friday where they gave out ExoPC tablets for developers, and I was lucky enough to get one. Intel is making a big MeeGo push -- they want lots of apps available for this platform, so they're trying to make it as easy as possible for develoeprs to make new apps for their AppUp store. Meego looks fun -- it's a real Unix under the hood, with a more or less mainstream kernel and a shell. I'm looking forward to developing for it; in theory it can run Python programs (using Qt or possibly even gtk for the front end) as well as C++ Qt apps. Of course, I'll be writing about MeeGo developing once I know more about it; for now I'm still setting up my development environment. 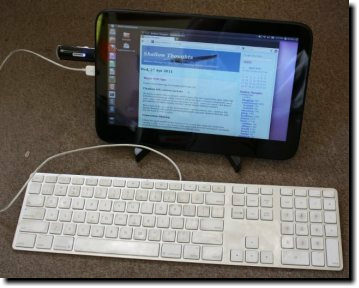 But on a lazy Saturday, I thought it would be fun to see if the new Ubuntu 11.04, "Natty Narwhal", can run on the ExoPC. Natty's whizzy new "Unity" interface (actually not new, but much revamped since the previous Ubuntu release) is rumoured to be somewhat aimed at tablets with touchscreens. How would it work on the ExoPC? The first step was to create a bootable USB stick with Ubuntu on it. Sadly, this is not as easy as on Fedora or SuSE. Ubuntu is still very CD oriented, and to make a live USB stick you need to take an ISO intended for a CDROM then run a program that changes it to make it bootable from USB. 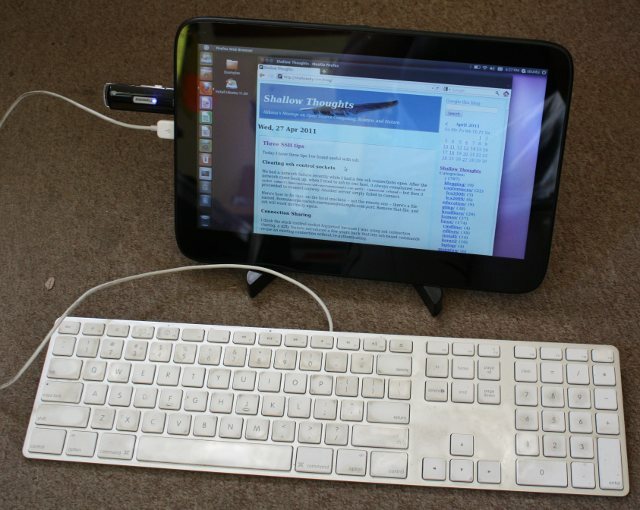 There are two programs for this: usb-creator and unetbootin. In the past, I've had zero luck getting these programs to work except when running under a Gnome desktop on the same version of Ubuntu I was trying to install. Maybe it would be better this time. No clue about what went wrong or why. Okay, on to unetbootin. When I ran unetbootin, it gave me a helpful dialog that "unetbootin must be run as root." Then it proceeded to show its window anyway. I can read, so I quit and ran it again as root. I chose the iso file, clicked OK -- and it worked! In a minute or two I had a bootable Ubuntu USB stick. ... at which point I found I couldn't actually do much without a keyboard. I couldn't sign on to our wi-fi since I couldn't type the password, and I didn't have any local files installed. But wait! I had an SD card with some photos on it, and Ubuntu recognized it just fine and popped up a file browser. But I wanted to try net access. I borrowed Dave's Mac USB keyboard to type in the WPA password. It worked fine, and soon I was signed on to wi-fi and happily browsing the web. What about an onscreen keyboard, though? I found one, called "onboard". It's installed by default. Unfortunately, I couldn't find a way to run it without a keyboard. Unity has a "+" button that took me to a window with a text field labeled Search Applications, but you have to type something there before it will show you any applications. I couldn't find any way to get a list of applications without a keyboard. With a keyboard, I was able to find a terminal app, from which I was able to run onboard. It's tiny! Far too small for me to type on a capacitive display, even with my tiny fingers. It has no man page, but it does have a --help argument, by which I was able to discover the -s argument: onboard -s 900x300 did nicely. It's ugly, but I can live with that. Now if I can figure out how to make a custom Unity launcher for that, I'll be all set. With onboard running, I gave Dave back his keyboard, and discovered a few other problems. I couldn't scroll in the file browser window: the scrollbar thumb is only a few pixels wide, too narrow to hit with a finger on a touchscreen, and the onboard keyboard has no up/down arrows or Page Up/Down. I tried dragging with two fingers, but no dice. Also, when I went back to that Unity Search Applications screen, I discovered it takes up the whole screen, covering the onscreen keyboard, and there's no way to move it so I can type. Update: forgot to mention that Unity, for all its huge Playskool buttons, has a lot of very small targets that are hard to hit with a finger. It took me two or three tries to choose the wi-fi icon on the top bar rather than the icon to the left or right of it, and shutdown is similarly tricky. So Natty's usability on tablets isn't quite there. Still, I'm impressed at how easy it was to get this far. I didn't expect it to boot, run and be so usable without any extra work on my part. Very cool! And no, I won't be installing Natty permanently on the ExoPC. I got this tablet for MeeGo development and I'm not welching on that deal. But it's fun to know that it's so easy to boot Ubuntu when I want to. It describes the boot sequence, from grub to kernel loading to init scripts to starting X. Part I covers the classic "SysV Init" model still used to some extent by every distro; part II will cover Upstart, the version that's gradually working its way into some of the newer Linux releases. How often does updatedb really need to run? That's the script that updates the database for locate, Linux's fast find system. I figured I must have screwed something up when I moved that slocate cron script from cron.daily to cron.weekly (because I hate having my machine slow to a crawl as soon as I boot it in the morning, and it doesn't bother me if the database doesn't necessarily have files added in the last day or two). But after talking to some other folks and googling for Ubuntu bugs, I discovered I wasn't the only one getting that mail, and there was already a bug covering it. Comparing my setup with another Hardy user's, I found that the file slocate was failing to find, /etc/updatedb.conf, belongs to a different package, mlocate. If mlocate is installed, then slocate's cron script works; otherwise, it doesn't. Sounds like slocate should have a dependency that pulls in mlocate, no? Okay, forget the first two, but we have locate, mlocate, and slocate. How do they relate? locate: 72 lines! but a lot of that is comments and pruning, and a lot of fiddling to figure out what version of the kernel is running to see whether it can pass any advanced flags when it tries to renice the process. In the end it calls updatedb.findutils (note no full path, though it uses a full path when it checks for it earlier in the script). slocate: A much simpler but unfortunately buggy 20 lines. It checks for /etc/updatedb.conf, runs it if it exists, fiddles with ionice, checks again for /etc/updatedb.conf, and based on whether it finds it, runs either /usr/bin/slocate -u or /usr/bin/slocate -u -f proc. The latter path is what was failing and sending root mail every time the script was run. mlocate: an even slimmer 12 line script, which checks for /usr/bin/updatedb.mlocate and, if it exists, fiddles ionice then runs /usr/bin/updatedb.mlocate. What is this mlocate? The m stands for "merge": the advantage of mlocate is that it can merge new results into its existing database instead of replacing the whole thing every time. Sounds good, right? However, the down side is that mlocate apparently can't to purge its database of old files that no longer exist, and these files will clutter up your locate results. Running locate -e will keep them from being printed -- but there seems to be no way to set this permanently, via an environment variable or .locaterc file, nor to tell updatedb.mlocate to clean up its database. So you'll need to alias locate to locate -e if you want sensible behavior. Or go back to slocate. Sigh. The important thing is to get rid of most of those spurious updatedb cron scripts. You might choose to run updatedb daily, weekly, or only when you choose to run it; but you probably don't want five different scripts running two different versions of updatedb at different times. The packages obviously aren't cleaning up after themselves, so let's do a little manual cleanup. That find.slocate script looks suspicious. In fact, if you run dpkg -S find.notslocate, you find out that it doesn't belong to any package -- not only should the .dpkg-old version not be there, neither should the other one! So out they go. As for slocate and mlocate, it's important to know that the two packages can coexist: installing mlocate doesn't remove slocate or vice versa. A clean Hardy install should have only mlocate; upgrades from Gutsy are more likely to have a broken slocate. Having both packages probably isn't what you want. So pick one, and remove or disable the other. If mlocate is what you want, apt-get purge slocate and just make sure that /etc/cron. */slocate disappears. If you decide you want slocate, it's a little trickier since the slocate package is broken; but you can fix it by creating an empty /etc/updatedb.conf so updatedb.slocate won't fail. Seems like each new Ubuntu release makes a few gratuitous changes to the syntax of system files. Today's change involves autologin, controlled by the "upstart" system (here's what I wrote about the previous syntax for autologin under upstart). Update: this changed again in Karmic Koala: the file has moved from /etc/event.d/tty1 to /etc/init/tty1.conf. The simple auto-login without gdm which I described a year ago stopped working when I upgradeded to "Edgy Eft". As part of Ubuntu's new "Upstart" boot system, they've replaced /etc/inittab with a new system that uses the directory /etc/event.d. That's it! If you want to run X (or anything else) automatically, that works the same way as always. Update: This changed again in Hardy. Here are the details. And then changed again in Karmic Koala: the file has moved from /etc/event.d/tty1 to /etc/init/tty1.conf. I've been unable to persuade Ubuntu's "Dapper Drake" to log me in automatically via gdm. My desktop background flashes briefly during the login process, then vanishes; it appears that it actually is logging me in briefly, then immediately logging me out and presenting me with the normal gdm login screen. I never liked gdm much anyway. It's heavyweight and it interferes with seeing shutdown messages. The only reason I was using it on Hoary was for autologin, and with that reason gone, I uninstalled it. The fix turned out to be trivial: make the X server setuid and setgid (chmod 6755 /usr/bin/X). Mode 4755 (setuid only, no setgid) also works, but other Debian systems seem to set both bits. The next question was how to implement auto-login without gdm or kdm. I had already found a useful Linux Gazette article on the subject. The gist is that you compile a short C program that calls login with your username, then you call getty with your new program as the "alternate login program". Now, I have nothing against C, but wouldn't a script be easier? That logged me in, but I ended up on /dev/console instead of /dev/tty1, with a message that I had no access to the tty and therefore wouldn't be able to use job control. X didn't work either. The getty is needed in order to switch control from /dev/console to a real virtual terminal like /dev/tty1. Of course, running X automatically once you're logged in is trivial, just a line or three added to .login or .profile (see the Linux Gazette article referenced above for an example). It works great, it's very fast, plus I can watch shutdown messages again. Nice!